I had a lot of fun visiting friends in Toronto this past weekend – maybe too much fun right before getting back into the school grind…oops! So. 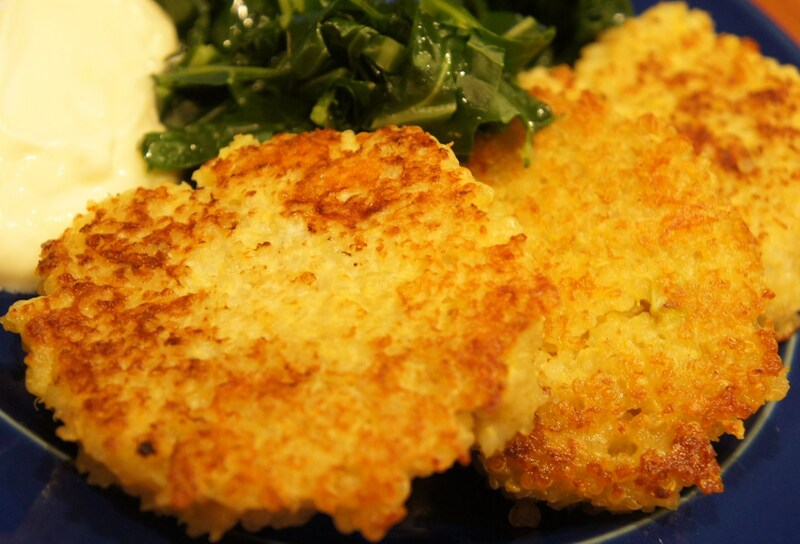 After the first day back at school I had a craving for something cheesy, but didn’t feel like going into a large-burger-induced-food-coma afterward…cue cheesy quinoa cakes. The recipe I followed was great, but I think next time I would add just a tad more cheese and would definitely include some more veggies, or some herbs. As it was, I used about 3 times as many green onions as the recipe calls for and I think it would have been even tastier with some more veg — maybe shredded carrots or zucchini? Yum! 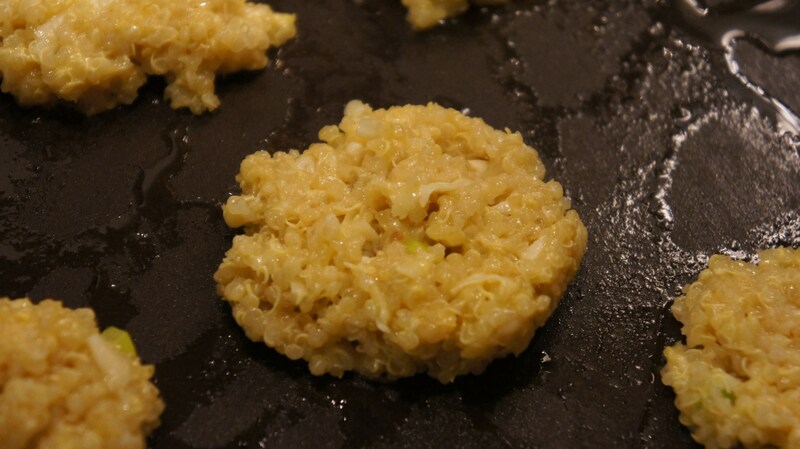 Quinoa cakes on the stove. *If you’ve never cooked quinoa before, don’t be afraid! It’s super easy and only takes about 15 minutes. Some good instructions for first time quinoa cooks are here. Good luck!! For the aioli, I simply mixed together 1/2 cup of non-fat yogurt, 1/4 cup of mayonnaise, the juice from one lemon, 2 crushed cloves of garlic, a pinch of cayenne pepper and salt & pepper to taste. Don’t you love when something so tasty is healthy, too!? Success! This entry was posted in Food, Glorious Food!, Nutritious & Delicious and tagged burger, cheese, healthy, recipe, toronto, vegetarian by kshap. Bookmark the permalink. Katie – I’m making these tonight! Bruce will love them! Your family was definitely ahead of the game on this one. The first time I ever tried quinoa (or even heard of it) was at your place.